Cash-outs from a former employer’s plan, an option for workers changing jobs, are the largest source of leakages. These lump sum cash distributions could be prohibited, leaving three options that preserve workers’ savings: keep the money in the former employer’s 401(k), transfer the 401(k) into the new employer’s 401(k), or, as a last resort, transfer the 401(k) to an IRA. 401(k) hardship withdrawals are permitted for predictable expenses such as college and home purchases, as well as unexpected expenses for disability, medical care, or job loss. The criteria could be tightened to cover only severe, unexpected hardships. Penalty-free 401(k) and IRA withdrawals, now permitted for workers over age 59½, signal that withdrawals are acceptable years before they reach an appropriate retirement age. The age for withdrawing money without paying the 10 percent tax penalty could be raised to 62, which is Social Security’s earliest eligibility age. Reforms to stop a serious and growing threat to retirement savings could help protect workers from themselves and significantly improve their retirement income security. 1. The fees of the investment companies deplete the account, and the leakage increases with increased funds in the account. Is there a proposal to address this? 2. To people who lose jobs, this post can be read as an insult. Unemployment insurance last a mere 26 weeks; after that, the jobless person is left to fend for him or herself monetarily. Without financial support, what is the jobless person to do? Survival today (through withdrawing funds from an IRA or 401k) will always trump retirement, that is a longer way off. I would find such reforms sanctimonious on the part of the reformers and not cognizant of emergencies that crop up. What is worse is what has happened to our collective 401(k): Social Security. Since the 1983 reforms, Generation Greed has been reliably putting extra money into this account — then borrowing from it and spending the proceeds. As a result, we have a large paper balance in that collective 401(k), offset by a debt to that 401(k). 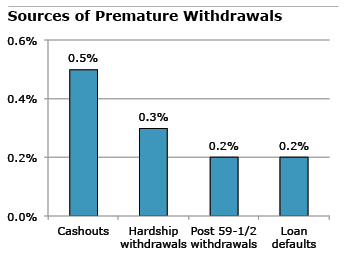 We didn’t withdraw 1.5%, we withdrew more than 100.0%.